For more than a year I’ve been writing and story editing a dating adventure game called LongStory. 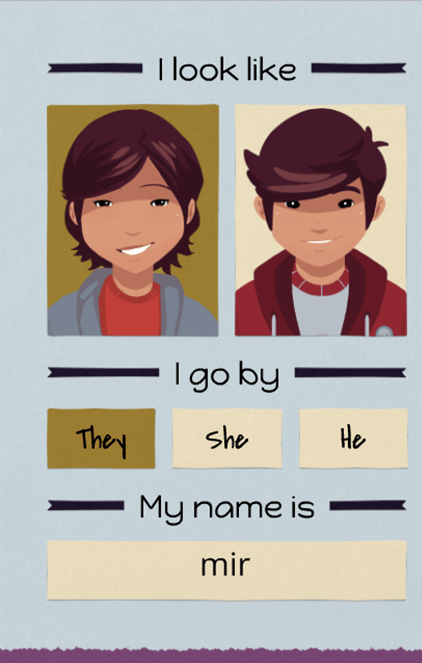 At the start of the game, players select their avatar and gender, choosing whether they want to be referred to as “she”, “he” or “they”. We don’t write different dialogue or storylines for different player genders. LongStory is written to be gender-inclusive. Unless you were raised by gender-free aliens, you’ve been conditioned to see people differently based on their gender, especially when it comes to romance. Heck, society conditions us not only to see people differently but to act differently based on our assigned gender. It’s important to recognize these expectations for what they are: stereotypes, not facts. Stereotypes such as “girls are more emotional” and “boys don’t talk about their feelings they act on them” abound. While some boys may not be comfortable talking about their feelings, some boys are. And vice versa; not all girls want to engage in lengthy heart-to-hearts. Here’s a test for you: write a romantic scene between two characters (boy-girl, girl-girl, boy-boy, agender-bigender, etc), then switch up the characters’ genders. Does the scene still make sense? If you don’t think it does, ask yourself why and identify the lines you’ve written that you think are more one gender than another. Are the lines stereotypical? If so, can you make them more well-rounded or original? If the lines in question don’t evoke specific stereotypes, what is it about these lines that makes you connect them to a certain gender? Figure that out and you’ll have identified your own biases. Now challenge those biases. Instead of concluding “a boy would never say that,” consider the type of person, regardless of gender, who would say that. Write for character, not gender. We humans tend to focus a lot on our differences, but if you’re writing gender-inclusive romance, you need to zero in on all the things we have in common. This doesn’t mean making character dialogue bland and generic, it means developing characters based on their personalities not their gender. Do not fall back on stereotypes. Stereotypes are simple shorthand and the opposite of well-rounded characters. A couple months ago I interviewed for a job as Lead Writer on a video game in a genre I love but in which I don’t have any actual paid writing experience — a virtual reality sci-fi adventure for adults (I usually write comedy and/or romance for kids and teens). The game sounded awesome and I wanted the job so bad, though I worried I didn’t have the right experience to get it. However, the producers want a game where players not only pick their gender but also the gender of their in-game spouse, and the fact that I had written and story edited a gender-inclusive game was a big plus in their eyes, so I got the job! Yay! 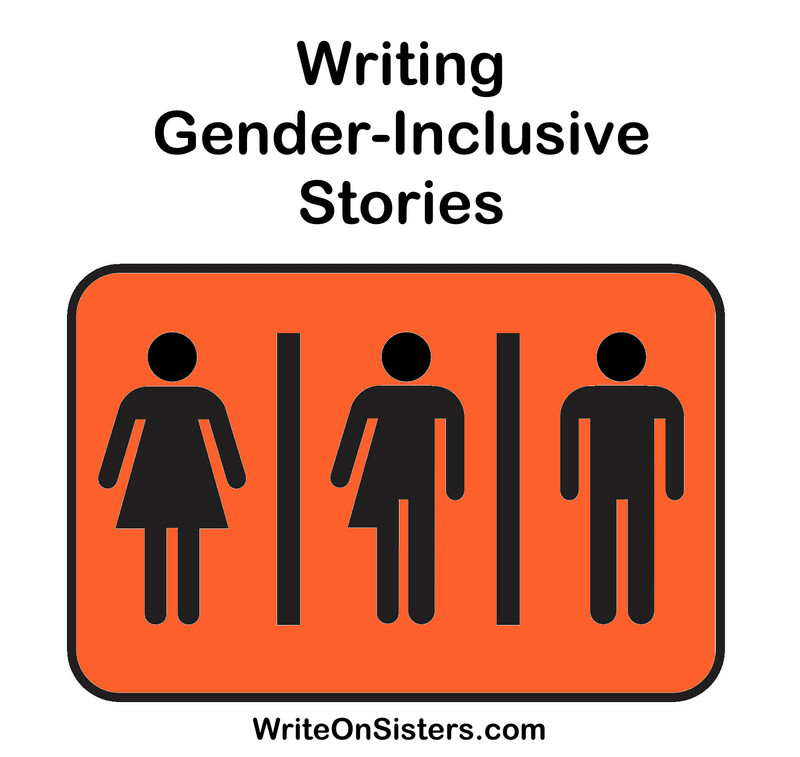 Do you consider gender inclusivity when you write? Have you ever written a gender-neutral character? If so, or if you have any questions, let me know in the Comments. I’ve done a few gender-swapping writing exercises. They revealed a lot of troubling biases that I never knew I had.